Treasury yields breakout to the upside. After the tightest trading range since 1978, the 10-year Treasury yield has moved up more than 10 basis points (0.10%) during the last two trading sessions, now standing at 2.97%. One of the biggest driver of the move in yields was whispers regarding changes to the Bank of Japan’s (BOJ) monetary policy program. The BOJ is apparently looking for ways to make its policy more sustainable, as it has been costly to peg their 10-year government bond yield near 0%. Changes to their policy resulting in higher Japanese government bond yields would likely also press yields higher globally as well. The BOJ’s next decision will come on July 31, and investors will be keen to look for not only any change to policy (though no actual change is expected) but any change to nuance or language surrounding the policy. Powell says Fed on track…”for now”. In this week’s Bond Market Perspectives, we dive into Jay Powell’s semi-annual Senate Banking Committee testimony last week: what he said, why it matters, and how markets reacted. Post-meeting, politics has entered the Federal Reserve’s (Fed) realm, whose role is supposed to be above the political fray and unencumbered by political considerations. We discuss how that might affect the Fed’s course as well. A tale of two PMIs. While the Eurozone flash manufacturing purchasing managers’ index (PMI) hit a two-month high, Japan’s flash manufacturing PMI fell to a 20-month low on the heels of slowing demand. Eurozone data did disappoint on services though. As we explained in our recently released Midyear Outlook 2018: The Plot Thickens publication, we favor domestic and emerging markets equities over international developed markets; particularly Europe due to European growth having potentially peaked. Energy, technology and financials fuel earnings growth. Technology, energy, and financial companies in the S&P 500 Index are expected to be the main drivers of second-quarter profit growth. 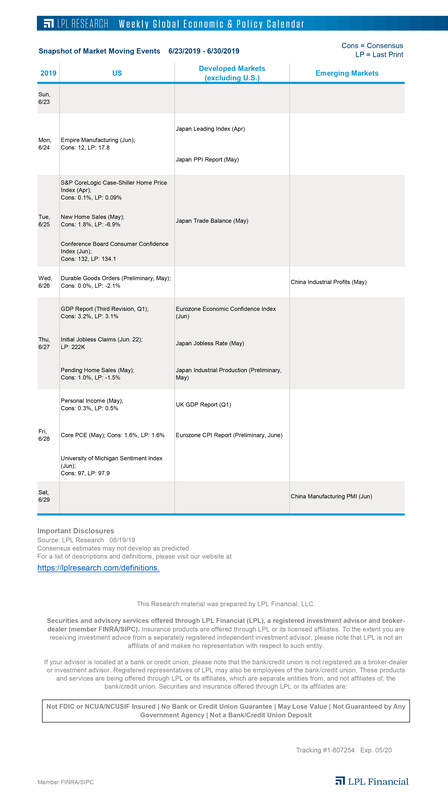 On today’s blog (and this week’s Weekly Market Commentary), we dig further into the high expectations for these sectors, and the impact of tariffs on consensus estimates for other industries. Investing in foreign and emerging markets securities involves special additional risks. These risks include, but are not limited to, curecny risk, geopolitical risk, and risk associated with varying accounting standards. Investing in emerging markets may accentuate these risks.